Halloween is an exciting holiday for kids, but for children with autism it may be challenging. If last year’s trick-or-treating adventure left you scared to try it again, this year can be less stressful, even FUN! Preparation and planning help minimize the challenges associated with a night of trick-or-treating. 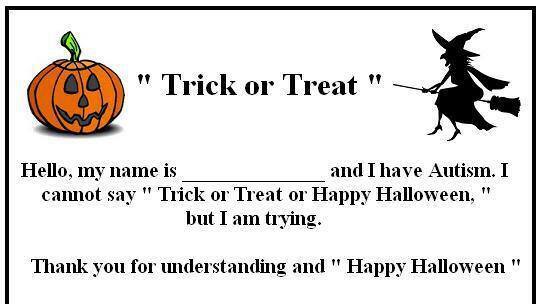 Talk to your clinician to utilize this timeline during therapy hours the weeks leading up to Halloween. Talk to your child about all the parts of their costume, including masks, makeup, cape, etc. After you talk, have them practice getting the costume on and wearing it for short periods of time, increasing the duration over time. Practice the trick-or-treating steps around your home by knocking on doors, saying “trick-or-treat”, not entering the pretend home, and saying “thank you” after receiving candy. Practice safety commands, like “Hold my hand” or “Stay by me”. Discuss or read Halloween social stories to explain the process of trick-or-treating and safety. Click here for a copy of a Halloween Social Story! If the idea of a costume is too stressful, consider a Halloween costume that fits over your child’s regular clothes, such as butterfly wings or a funny skeleton t-shirt. Set reasonable goals. If last year they did not go to a single home, maybe one house, or a walk around the block is an appropriate goal this year. Build on this goal next year. Tell your child what they can expect to see, do, and hear. Drive through the neighborhood and tell them the houses you plan to visit, or show them images on Facebook or Google Images of other costumes they may see on Halloween night. Have a plan for if your child feels too stressed. For example, go to the car until they are ready to return. It is ideal to finish trick-or treating on a positive note so returning next year is not SO intimidating. Arrange to practice outside your home; go to a coworker or neighbor’s house. Set expectations: discuss do’s and don’ts and the consequences for following directions. It is very important that kids know what they should do, too often we tell kids all the things they shouldn’t do, leaving them wondering what is the right thing to do. Partner with family or friends that your child likes, this familiar face may set your child at ease. What to do with all that candy? Save some for edible reinforcers for therapy. Freeze for a special reward to be earned for meeting future goals! While the school setting is one of the most important group environments we want the children to learn and thrive in, there are other groups that may function either as stepping stones to ease a child’s transition to the school environment or as extra curricular activities for a child already in school. A Technician from the in-home program can accompany the child to help facilitate the transition to group routines and instructions, promote generalization of skills acquired at home to the new environment, and to encourage interaction with other children. Below, you will find a brief and general description of elements characteristic of these activities that may help you decide which activity your child might like and benefit from the most. We are here to assist with this process. Please speak with your clinician if you are interested in integrating community activities! Instructors who teach gymnastic courses generally follow structured routines and thereby provide a learning environment not unfamiliar to the child. The clear structure increases the likelihood that the child will succeed and thrive in this milieu. For many children the gross motor activities often turn out to become reinforcing in themselves. For older children who have learned to wait in many situations, gymnastic courses may work out wonderfully. The basic levels of this sport typically do not demand much interplay. The children use their own balls, they are on the field together and they learn by imitating their coach and each other. They learn to watch out for each other and have fun. These are classes of short duration, often a few days to a couple of weeks. An instructor would most likely be welcomed. An instructor or a parent may check their child’s interest in these activities beforehand and pick the one(s) of highest interest. In some local communities children can begin as early as age 5 or 6 and provides an extracurricular activity where children interact with their peers from school. It may be a good idea to observe these group activities before parents enroll their children, as activities and structure depend on the scout leader and his or her leadership style. These events are a great opportunity to practice skills in an environment where other parents understand the unique needs of your child. Events are often activity-based and include a variety of games, social activities to opportunities to attend activities in the community such as the movies or bowling. Events tend to change frequently so it is a great opportunity to try new activities.